The new Super Smash Bros. is out for 3DS in Japan, which means that we now finally know the full roster of characters that will appear in the upcoming Nintendo mascot fighter, from Mario to [SPOILERS]. Well, really, we knew the full roster last month. When it leaked. 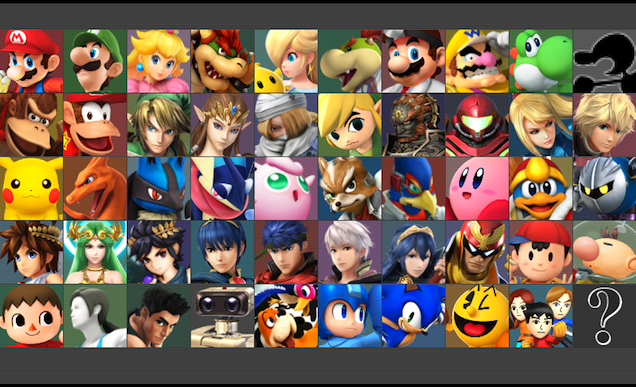 But now we can definitively say that, short of any obscure hidden secrets or downloadable additions, we have the full list of Smash characters both new and old. For your convenience, we're breaking them all down here. This post contains SPOILERS for the new Smash roster, obviously. That's all of them. 49 characters, from all eras and ages of gaming. It's a pretty solid roster, complete with much-requested additions (Mega Man!) and one insane surprise (Duck Hunt Dog!). That's a total of 34, though two of those—Sheik and Zero Suit Samus—were just transformations in previous Smash games. One, Charmander, was part of the Pokémon Trainer's army in Brawl but is now a standalone character. Characters missing from this list include Ice Climbers, Lucas, Snake, Mewtwo, the Pokémon Trainer and his other two critters, Roy (also MIA in Brawl), Wolf, and Young Link (who was replaced by Toon Link a long time ago). That's 15. More if you consider all the possible variations on the Mii. Plus, Robin can be a man or a woman, Bowser Jr.'s alternate costumes are the seven Koopalings (Roy, Iggy, Lemmy, Larry, Morton, Wendy, Ludvig), and Duck Hunt Dog is the goddamn dog from Duck Hunt. We'll update this post if/when Nintendo adds more characters to the lineup. Super Smash Bros. is out for 3DS in October, and Nintendo promises that it's coming to Wii U this holiday.